Tasleema does not remember the last time she lived somewhere she could call home. As she fled Arakan in Myanmar to Cox's Bazar in Bangladesh and finally arrived in New Delhi, Tasleema, a member of the besieged Rohingya community, found that she was always on the move. A fire in the only Rohingya camp in Delhi has displaced her again. At least 44 shanties housing Rohingya refugees in southeast Delhi's Sarita Vihar were gutted in a fire early last Sunday. It left 226 Rohingyas, including 100 women and 50 children, homeless once again. Tasleema, 23, was among the 75,000 Rohingyas, the majority of them Muslims, displaced by two waves of violence between Buddhists and Muslims in Rakhine in 2012. Thousands of people fled Myanmar then to take refuge in neighbouring countries, including India. "I have been on the move since I was 17. My children have been born as refugees and they are growing up seeing one problem after another," she told PTI. The fire that broke out because of a short circuit in the electrical wiring system in the camp spread rapidly and razed it to the ground. No casualties were reported, but the refugees lost all their belongings, including their UNHCR refugee cards which help prevent arbitrary arrests, detention and deportation. The fire spread fast as many of our tents had plastic coverings and the houses that had gas cylinders burst, spreading the fire further," Abu Fazal, another resident of the camp, said. Refugee Amina Begum noted how they had made peace with their situation and were trying to rebuild their lives, but the fire not only destroyed their shanties but also their hope of finally burying the horrors of the past. "I had bought a sewing machine using which I started making clothes to earn a living but I even lost that machine in the fire. It is like we have been pushed six years back from where we started," Amina, 28, said. Children in the camp still look for their belongings in the charred debris every day since the fire, she added. We are still trying to cope up but what do I tell my children who lost all their toys and school books in the fire? Amina said through a tattered curtain in a tiny space where she was trying to put her six-month-old baby to bed. 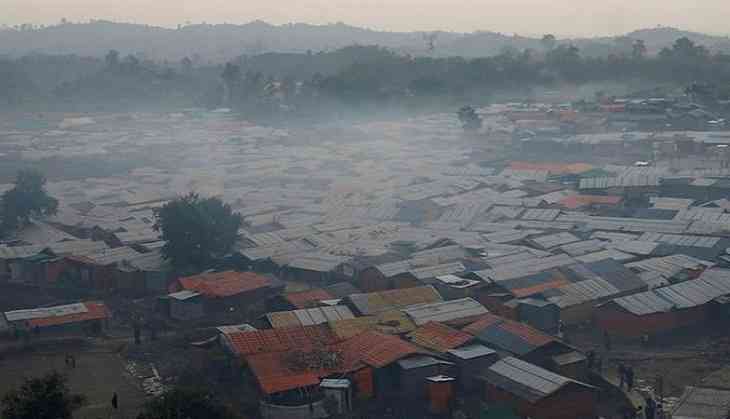 Before the fire, the Rohingya refugees had constructed several brick and mud huts. They are now living under plastic covers. The men sleep outside and the women inside some 20 makeshift tents covered with dupattas, clothes and mosquito nets. NGOs representatives said the camps lacked basic services such as sanitation, healthcare, education facilities or drinking water and after the fire the living condition in the shelter had further deteriorated. "Children are especially vulnerable to mosquitoes and diseases and the makeshift camp is further increasing their vulnerability," said Syed Azhar, national secretary of the Students Islamic Organisation of India, one of the groups seeking to provide aid to the refugees. Many refugees have lost their means of livelihood with the fire. "The refugees had their own small society inside with small grocery and tailoring shops. Now they have to start from scratch," Azhar said. The UNHCR, the UN's refugee agency, told PTI it had reissued cards to the 226 refugees that could act as their identification document. As a matter of priority, UNHCR has re-issued documents to affected families. UNHCR ID cards help prevent arbitrary arrests, detention and deportation of refugees and asylum-seekers and ease their access to essential services such as health and education and legal assistance. Temporary shelter arrangements are currently in place near the site. Other shelter options are being explored," UNHCR policy associate Ipshita Sengupta said in response to an email. She said UNHCR and partners were closely monitoring the situation. A coordination platform has been establishment with UNHCR and partner agencies to take stock of assistance provided, identify unmet needs and coordinate response accordingly. We are working closely with the authorities for coordination of assistance and any other interventions as needed, she added. But the refugees feared it was going to be a long haul. "We were given a temporary shelter but for how long would we be able to live in this makeshift arrangement? I have a family of eight to support with six children and the living conditions here are worse than those in the camp," said a daily labourer living in the camp. Myanmar had denied the Rohingya, who had lived for centuries in the Buddhist-majority country, citizenship since 1982, effectively rendering them stateless. The Rakhine area in Myanmmar witnessed a recent surge in violence when a Myanmar military operation in the country's northwest in August sent nearly 700,000 Rohingya Muslims fleeing to Bangladesh. The refugees reported killings, rapes and arson on a large scale. Asked if they ever want to return to Myanmar, many said there were days when they longed for their homes, but were scared at the thought of returning because they had heard that their extended families back home were still being subjected to violence. "In Myanmar, we needed special permission to cross a radius of 10 kilometres, but things are different here. We are adjusting and even slowly trying to cope with the recent fire disaster. India is our home now and we feel safe here," Abu Saleem, another resident of the camp, said as he looked at his twins playing nearby.